PaintScratch sells Toyota 4Runner touch up paint for the years listed in the table. 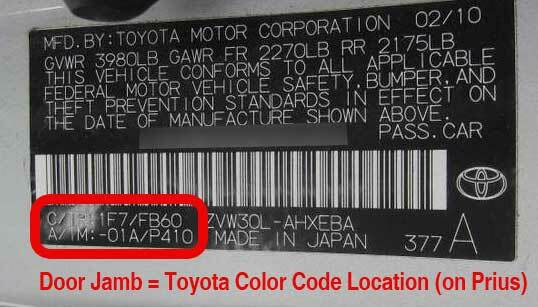 Click your Toyota 4Runner year to see available touch up paint colors. We guarantee Toyota 4Runner touch up paint will match the original factory color chip on Toyota’s manufactured after 1985. Order Toyota 4Runner paint pens, brush cap bottles, and spray cans from our secure online store. For small 4Runner scratches, the paint pen works well. For slightly larger Toyota 4Runner scratches and chips, a brush bottle is best. For larger paint repairs, a Toyota 4Runner spray paint can will deliver best results. Touch Up Paint Videos - Watch and learn how to apply touch up paint to your Toyota 4Runner. How To Apply Touch Up Paint - Detailed instructions for using automotive paint on your Toyota 4Runner. So the color code is 3P1 and the FA09 has nothing to do with the color code. These additional codes can cause confusion but they are really just interior option codes. The color code in the example image above is "1F7". Toyota, like all manufacturers, uses the exact same color across many models and then will have a different color name for each model. It's the same paint! This is why the color code is so important to order the correct paint. For example, 3P1 above we call Impulse Red Metallic Clearcoat. It could also be called Red Metallic Clearcoat, Wine Metallic Clearcoat, etc. depending on what the marketing department decided to call it. 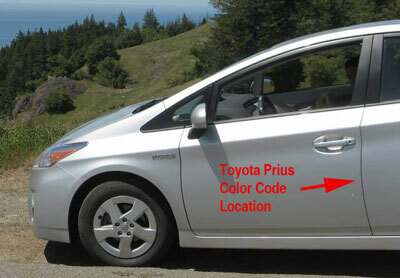 You can also find your color code by calling your dealer with your VIN. They can bring up the exact vehicle you bought and tell you the color code. You can also try calling Toyota at 1-800-331-4331. Grand Prairie , TX "Thanks Collin every one in the club says you are the best and you really do stand behind your word. Thanks"
Dallas, TX "Received your touchup kit and could not be more pleased with the results. Great product, and will definitely recommend to anyone in need of touchup paints and supplies"
Athens, GA "Received touch up paint several days ago. It was a perfect match. I wish I had found your company months earlier. Thanks"
Forest Hills , NY "Just wanted to let you know that an order I received for WG2 touch up matched perfectly, unlike the dealer stuff. I will definitely recommend your business. Thanks"